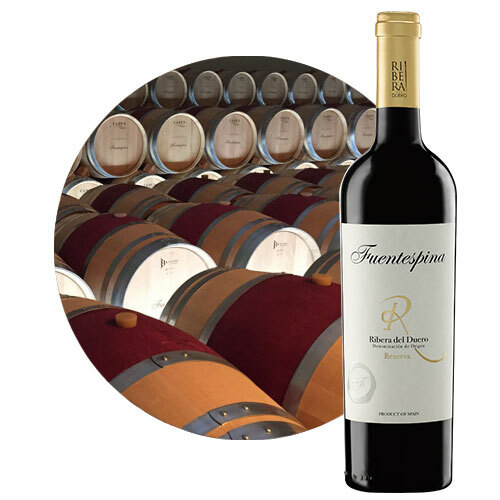 Fuentespina Reserva - Fuentespina & Montespina Wines. D.O. Ribera del Duero y Rueda (Spain). Fuentespina Reserva is a red wine from Ribera del Duero elaborated with grapes that exceed the highest quality levels for their structure and character. Aged for 14 months in French and American oak barrels, then it is bottled and aged for two years more in the cellar. It pairs perfectly with red meats, lamb and pork dishes, big game and cured cheeses. Cherry red colour with a garnet rim. It displays aromas of ripe black fruits on the nose, with toasty touches, spices, cacao and liquorice. It is fleshy, with great volume and structure and abundant tannin. Long, aromatic and very fine finish.